Back from Tucson Gem, Mineral & Fossil Show! And we have a video of the trip! Click here for a Special Document on Super Seven that I discovered. It's in PDF format. An important event in my year is the annual trip to Tucson, AZ for the Gem, Mineral and Fossil Show. It's been going on for years, but every year there are different things to discover. You might be surprised at the number of people who have download previous videos we produced at the show... nearly 40,000 views and counting. What we have done for some of our customers is we learn their interests and when we see something special at the show, we shoot video and stills and send them via email to gauge their enthusiasm for the piece. Some of the venues we visit try to restrict the use of cameras for security purposes, but we have had no trouble asking permission. Our 2018 trip to Tucson was a smashing success. We had so much fun, we filmed our adventures. We visited some of the hottest spots on the "Gem Trail." As you may know, the Tucson Gem, Mineral & Fossil show is one of the largest gatherings of gem hunter, paleontologists, geologists, miners, collectors, jewelers, beaders, designers, toolmakers and anyone with an abiding love of the earth, its mysteries and treasures. 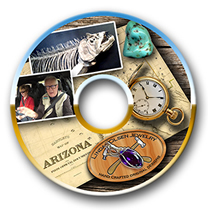 Join us on our exclusive tour of the Tuscon Gem, Mineral and Fossil Show! 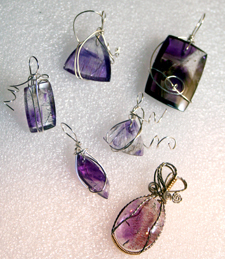 This silver and amethyst set is mounted in perfectly color matched stones. Linda knitted the chain and wire wrapped the bracelet. Sizes are custom to each order. This set was designed for display at the Dubuque Museum of Art, Dubuque, Iowa. Spectacular geodes filled with amethyst from Brazil. This is some of Linda's newest designs incorporating sardonyx, a mostly black agytized material, much containing quartz and druzy material that only enhances its metaphysical powers. Click on the image to view an enlarged image. At right a bold and beautiful slice of ocean Jasper from Madagascar. It's uncertain how this unique pattern is formed. The original discovery was made off shore in a remote area of Madfagascar. The mining took place on land expoded by low tide. This year's show in Tucson was amazing. Gary and I had two weeks to take it all in, and we spent our time and money (we hope) wisely. You get a pretty good flavor for the show in the videos we do, and this year did not disappoint. Gary happened upon an interesting display at the Mineral and Fossil Co-op on Oracle Avenue, an established building containing some of the most incredible speciments to be found. But this year as we were admiring the collection in one particular booth, we were met by the owner, Peter Larson. This South Dakota rancher and paleontologist, alolng with a team of dinosaur hunters that included Susan Hendrickson, were excavating speciments. Sue experienced a couple of flat tires some miles from their excavation site. She decided to walk back to the site when along the way she noticed bones protruding along the base of a butte she passed. This turned out to be the dinosaur discovery of the century. A splendid specimen of watermelon tourmaline in the matrix which is comprised of quartz. These naturally terminated and faceted crystals came from our mining contact in Brazil. The dealer from which we purchased the beautiful example of aquamarine crystals formed in a large lump of quartz. It weighs about 12 lbs and is almost the size of a bowling ball (below). This is the most interesting example of how gem material forms in the earth. It's a bouquet of aquamarine trapped in a translucent quartz formation. Linda tirelessly shopping the open market of gems, minerals and fossils. This vendor is from Brazil. Gem material lies in piles on a piece of tarpolin in a hotel parking lot..
From the dawn of time, man has recognized the uniqueness and beauty of the stones and pebbles he trod upon. The weapons he carried into battle were embellished with special stones to which he attributed powers of strength and protection. 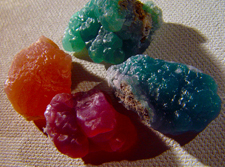 Other minerals and stones were ground and used as elixirs to treat various maladies and illnesses. For example, skeletons of ancient travelers are found adorned with pieces of turquoise that were thought to serve as a talisman of protection. These folk medicines, legends, superstitions, and talismans have been compiled into books that categorize and list the metaphysical properties of stones. Super Seven is a combination of seven minerals—amethyst cacoxenite, goethite, lepidocrocite, clear quartz, rutile and Smokey quartz. 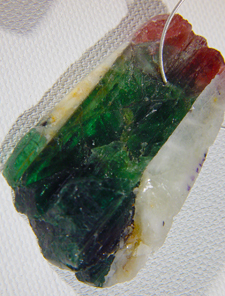 It is thought that the stone has the properties of the individual minerals as well as combined attributes. Super seven comes from the Grand Formation in the Espirito Santo mine in Brazil. The mine is closed and under water. The material has an auric light similar to St. Elmo’s fire. It is said to promote conscious awareness of that which has remained hidden for eons. It never needs cleansing or energizing. It is said to overcome daily tension and stress allow the natural energy of the body. Others claim that the seven minerals relate to the seven chakras of the body. I recommend this stone for someone who is looking for balance and then inspiration. This is a very beautiful stone that really draws people. When you wear it, you can expect people to comment on it. These are very clear and lovely specimens. In addition to the Super Seven, I was also able to purchase some gilalite from this miner. A lot of times, this material is rather cloudy, but I was able to buy some absolutely stunning and clear specimens. Gilalite is very rare and was first found in 2004 in Brazil, It was noted that only 10 kg of the material was found making it quite rare. It gets its name for the galialite inclusions and their resemblance to floating jellyfish. It was identified and authenticated by the Museum of Natural History in Paris and published in the fall issue of Gems and Gemology in 2005. I chose all of my medusa quartz personally. Metaphysically, it is an extremely playful and childlike stone. It is used to open up the heart chakra. It allows us to find our freedom of expression. It is a stone of peace and good will toward man. I especially recommend it for someone seeking peace and harmony in life. It is associated with the astrological sign of Libra. I float in the water, but I do not get wet. I am on the earth but not of the earth. Work as a group—not I, but WE. One practitioner of stone therapy said that gilalite was sent to cleanse our hearts of the hurts of life that we might be light spirited and take action inspired by the light rather than reacting to the darkness of the past. As Daniel and I were talking last February, he told me that one of the pieces of gilalite I picked up also had some covellite. It was hard to see of course, but there it was an inclusion of indigo blue with and iridescent hot pink flash. I was hooked on this stuff. I researched and found that covellite is pretty rare and not widely distributed. It is a copper sulfide—many of the coppers have the green color, so it makes sense that it would be found with the teal colored paraiba quartz. In itself, covellite is soft and not decorative, but included in the quartz, it makes a stunning piece that has a little secret something special that just you know about. Covellite was first described in 1832 by an Italian from specimens found on Vesuvius. It has been used to stimulate the third eye and initiate psychic power. It enhances communication and helps one have a positive outlook. It also encourages positive conversation. It assists in making dreams realities. And it is said that it can help bring a miracle to life. It is also thought to cause a rebirth in life. It is a “stone for the artist” promoting creativity that taps into the wisdom of the ages. Daniel found this material in the same region of Brazil as the super seven material that I have pictured. This is quite interesting because it is felt that the locations where this mineral is mined emanate the same kind of energy as a vortex where magnetic forces are abundant. Covellite has been used in the treatment of cancer to cause the disordered cells to reorder themselves and to purge toxins from within the body. Also, placing a piece of covellite near the sacral chakra is said to stimulate the process. It is also associated with the healing of disorders of the ears, eyes, nose and mouth and throat. Furthermore, it is used in the treatment of arthritis and rheumatism. I've been asked on more than a few occasions to create special jewelry for a special day, and recently I was given the encouragement and creative license to do something really special. Imagine the bride, bridesmaids all wearing a coordinated look that completes the theme of your wedding. The best part is that the jewelry serves as gifts, one of a kind creations, totally originally and designed especially for you and your special day. Click here and see my latest creations, The Bridal Set. Linda Olsen has become a leading information resource on the therapeutic and metaphysical properties of gems and minerals. She has taken her love of these materials and turned them into a thriving jewelry enterprise built on exclusive designs, custom craftsmanship, and designing each piece for individual customers in need of special support. 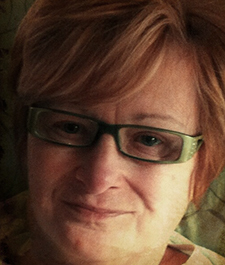 Linda's email box became so full of inquiries, the next logical step was to contribute to the "blogosphere." Linda keeps a journal of her experiences and contact with customers, the information from which she shares here in hopes of building a community of support. Occasionally Linda finds some whole goods that she just loves so much, she wants to share them with her clients and customers. Linda returned from the Tucson Gem and Mineral Show in February with some incredible finds. She discovered a whole new treasure trove of amber pieces from Russia. One of the pieces can be seen at left. The beading technique is fantastic. Click here to see the entire collection. 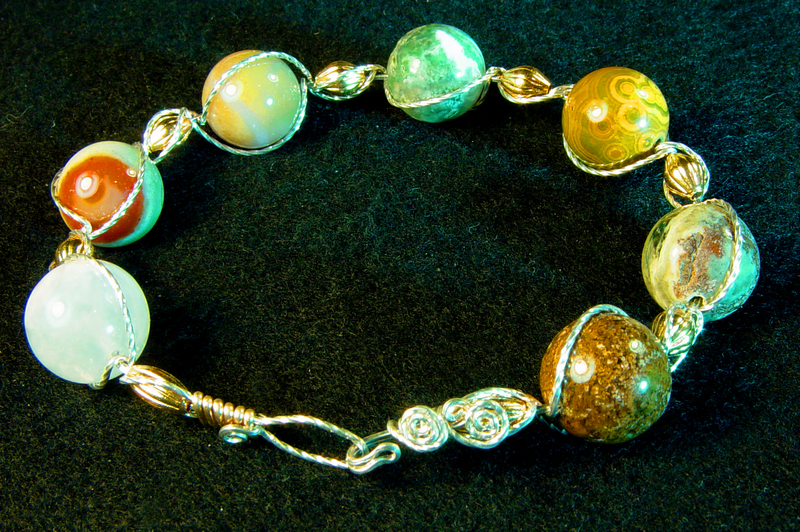 At left, an increasingly rare ocean jasper which I wire wrapped in an exclusive design. You can click on the images on this page to see enlargements. This is one of many spectacular Ocean Jasper cabochons I have wire wrapped. It is a very gemmy and beautiful stone found off the coast of Madagascar. Because of civil war there, and also aggressive collecting, good stones are becoming very difficult to find. I am fortunate enough to have purchased a great assortment when the stock was plentiful. 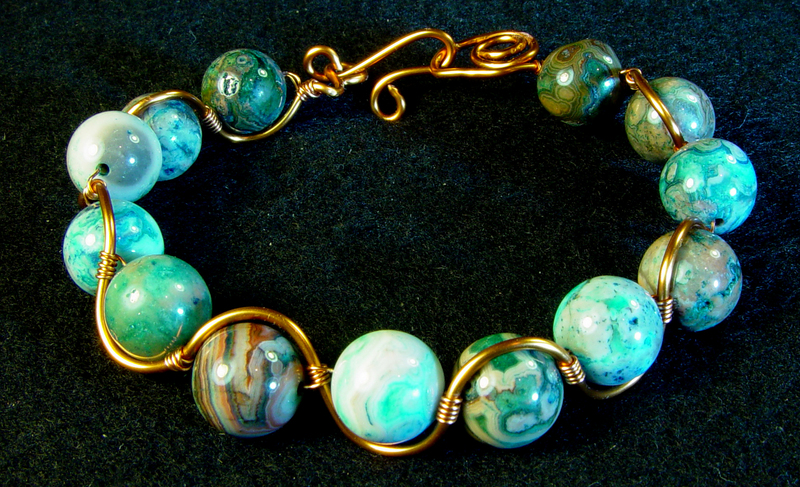 Ocean jasper is a very healing stone. It is a soothing stone useful in calming one’s thoughts. It helps us to overcome stuck patterns of thought and find physical balance. It helps us overcome overreaction to situations. It supports regeneration of tissues in the body, stabilizes the thyroid, and balances the body’s biochemistry. 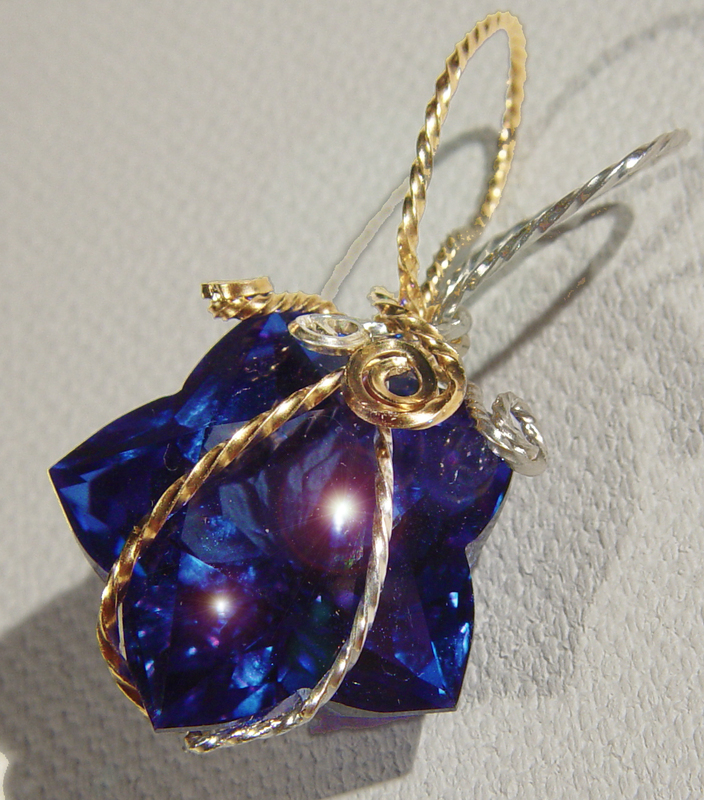 All stones are wrapped in gold-filled and sterling wire. Contact me for more samples. Wrapped pendants cost from 45 dollars on up depending on the quality and size of the stone. This is one of my favorite. 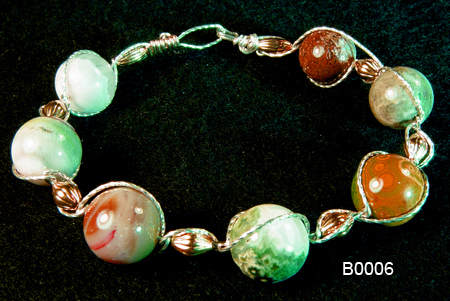 I love to see it paired with a strand of 4 mm ocean jasper beads. The Lucky Stone is a collection I sell that is enormously popular. 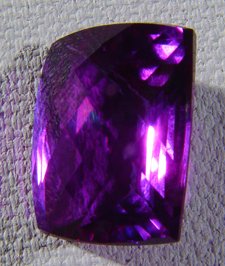 It is a created CZ stone that is Purple, green, pink, and yellow. It is stunning presentation cast in sterling. I also have some Luck stones that I have wire wrapped for the yellow gold lovers. 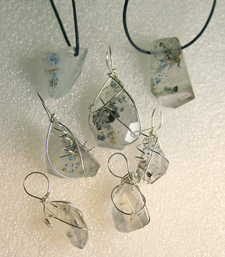 I have pendants, earrings and rings. The stone symbolizes: health, wealth, family and friends. If you are interested, contact me for a pix of what I currently have available. I charge 50 percent of the retail cost. For example, This pendant which has a stone of approximately 25 carats costs $70. I have lots of other. Just contact me. When I saw this one I just had to have it. You probably won’t see too many like it. 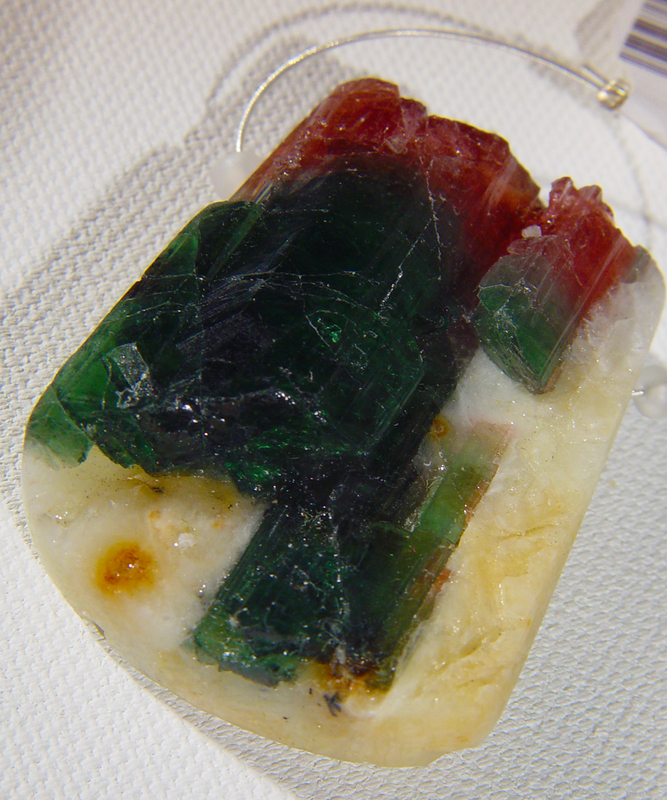 What we have here is a watermelon tourmaline focal piece in the matrix. Specimens of this color and size are just not that plentiful anymore. I actually got three of these, with this one being the largest. They are large, gemmy and very colorful. This piece sells for 600 dollars. It is not for the faint of heart. However, God is not making any more of these. It measures 1 1/4x1 ½ inches. 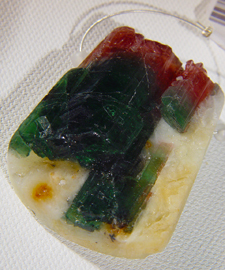 Watermelon tourmaline is a terrific stone for women. I will have a separate information page about its metaphysical properties. It is my favorite stone— so I am a huge fan. This tourmaline in the matrix is 1 1/2x1 inch and sells for 300. Watermelon tourmaline is a hugely healing stone for women. It is one off the few stones that relates to each off the chakras and is said to clear, maintain, and stimulate each of the center of the body. 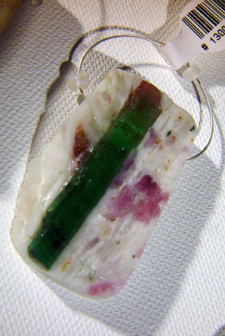 I have beautiful strands of tourmaline that would be gorgeous with this pendant as a centerpiece. If interested, let me know. You have to see this one for yourself to believe it because it is solid tourmaline with a little matrix on both sides. It is 1 3/4x1 inch. I costs 400 dollars, and really must be wire wrapped to preserve this delicate crystal structure... Specifically, watermelon tourmaline is the super activator off the heart chakra. It encourages one to look past the seriousness off an experience and see the benefit of and humor in the situation. 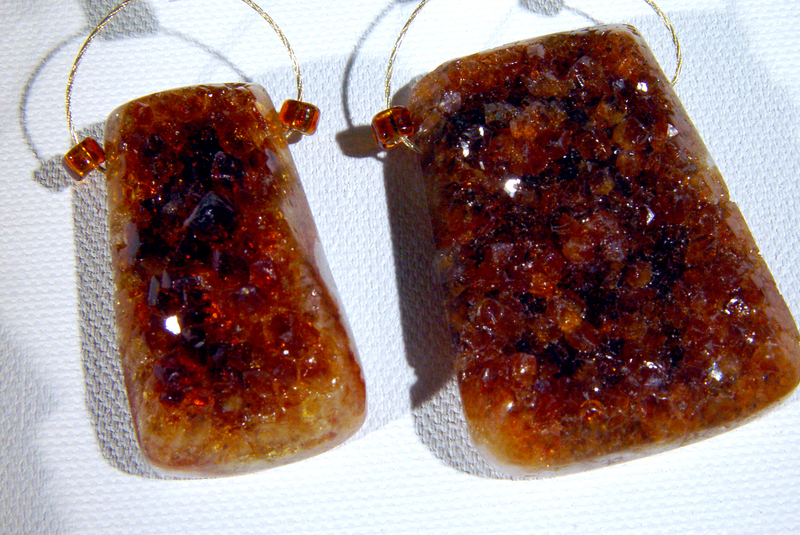 These are Madeira citrine druzies. I hunted all over the Bead and Button show in Milwaukee, and found only these two. They are drilled and attached to their matrix. The big one is 1 3/4x1 inch and the smaller one is 1x1/2. They are even brighter and livelier than the pix shows. They sell for $100 each. I think they would be even more impressive if they are wrapped and hung off a strand of citrine. Contact me if you want to be happy. I bought these cabochons from a guy in Tucson who had a display way off the beaten path. He actually sold some bid mineral samples, but had these cabs that he had for sale. He didn't even know that name of the stone. He thought it had quartz, chrysocolla and copper. The stone hasn't even been described in the annals of mineralogy. Take it from me, they are fabulous. My husband did a fabulous job of photographing this stone. 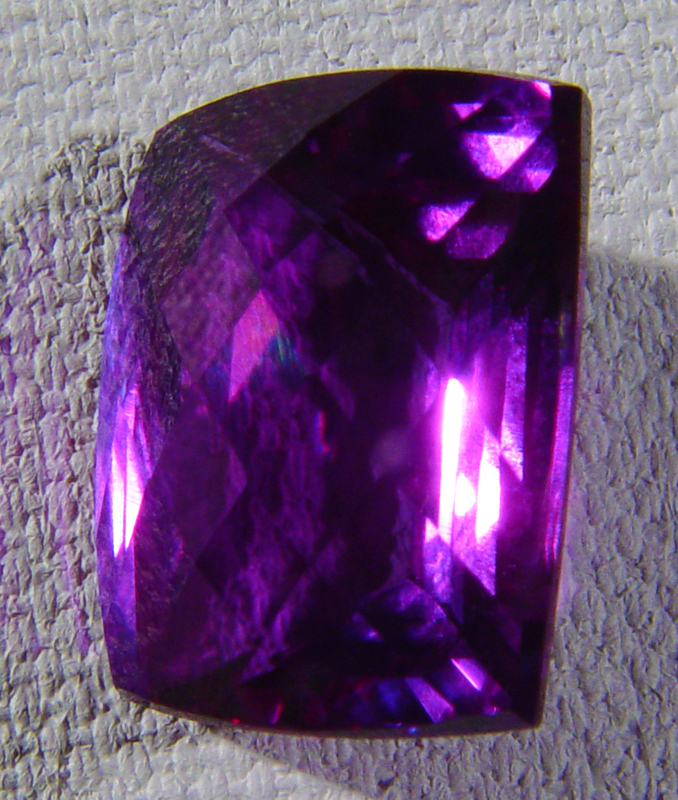 It is a 20 carat checker cut alexandrite— a rare stone. It changes color from raspberry to purple. It costs $500, and is a stunner. Alexandrite is a symbol of royal power and is considered a guardian stone. It is said to support longevity, purifies, and brings about joy. Legend has it that it slinks the wearer to the knowledge once stored in the library at Alexandria. It is said to bring luck in love. With its ability to show two colors at once, it allows you to see both sides of the picture. Physically, it is said to balance the nervous and glandular system, sooth tension in the neck muscles and eliminate the side effects off leukemia. These ametrines are just so beautiful that you have to see them for yourself. I have them in a variety to sizes and shapes ranging from 25 to 48 carats. 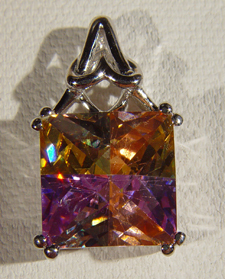 Ametrine is the perfect gift for an anniversary since it is said to combine the perfect balance of male and female. It combines is particularly useful in long-standing illness. It combines the power of two very therapeutic crystals— amethyst and citrine— and is said to provide insight into the cause of the disease. It opens the third eye and unites the masculine and feminine energies. It enhances compatibility and acceptance of others. It helps to overcome prejudice. It is an energetic stone that stimulates creativity, provides clarity and strengthens concentration. It is a powerful cleanser and eliminates toxins from the body. It is said to heal chronic fatigue and also is used for depression, ulcers, tension headaches, stress, and gastric disturbances. We recently were in Washington DC where my husband won an award for his videography, Cable Leaders in Learning. We had some leisure time and visited the Smithsonian where we once again paid homage to the Hope Diamond and all of the other wonderful gems and minerals. When we made a stop in the gift shop, we came upon these samples of smithsonite. This mineral was found and described by Smithson who donated the money to start the Smithsonian. I was excited to obtain these because smithsonite is very useful for panic attacks. It is the stone if tranquility, kindness, and favorable outcomes. It is used for extreme stress and alleviating mental breakdown. It is also used for sinus, digestive disorders and alcoholism. The different colors have specific properties. Note that the colors on the web site are more vivid than the specimens which are more subtle but very beautiful. 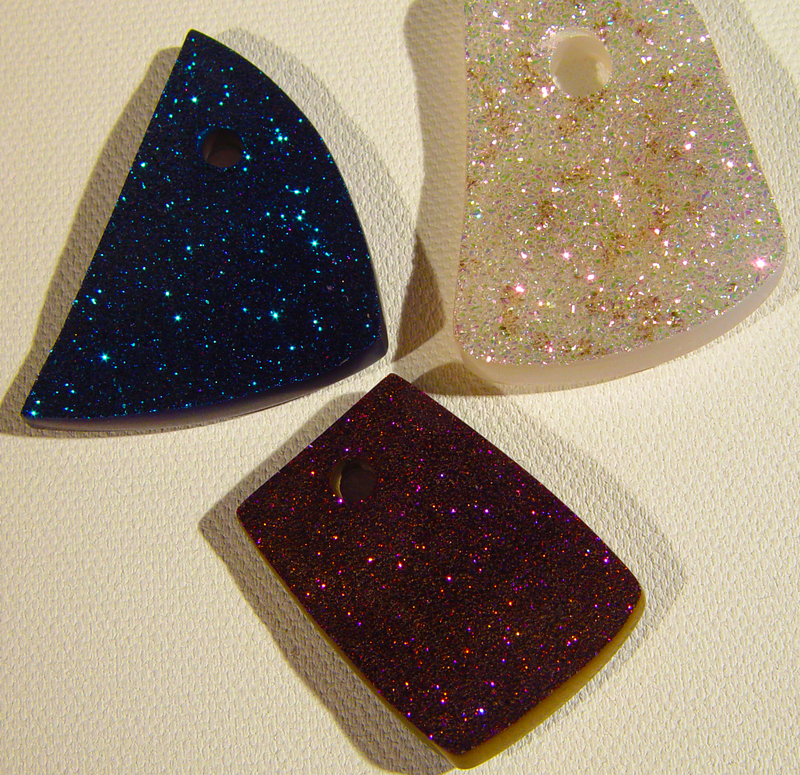 These are pairs of briolettes that are available for earrings. 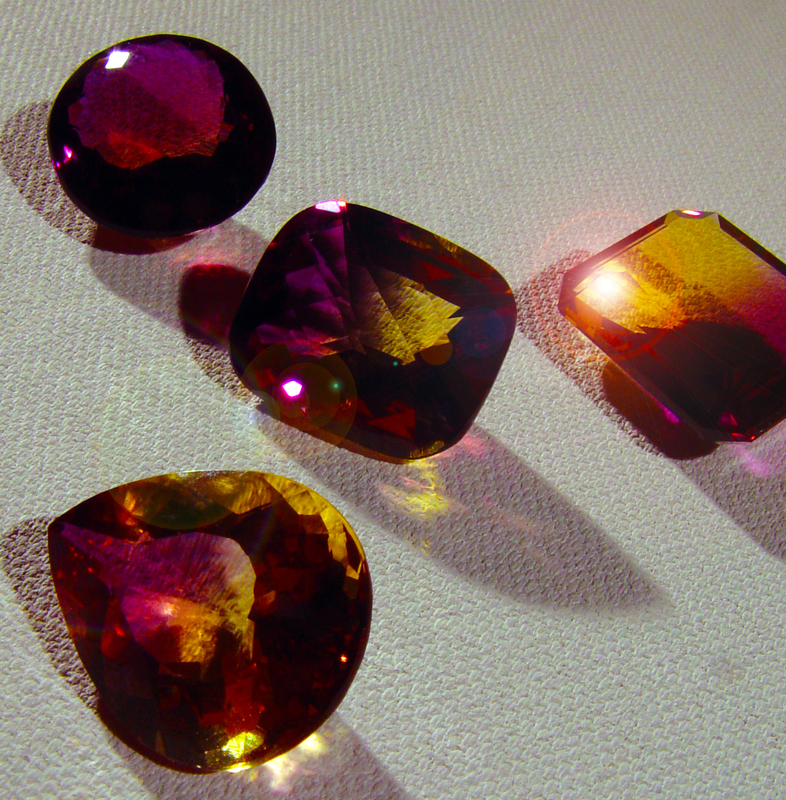 You will see red, green, blue, pink topaz and amethyst, citrine. They are about 25 carats a pair. It is difficult to get lovely matched briolettes of this size. 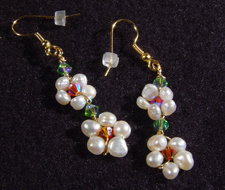 They will be hung from gold-filled or sterling mountings and will sell for $125 a pair. I promise a breathtaking pair of earrings. I have pendants to match each one. Love those druzies! I bought these from a vendor at the Bead and Button show in Milwaukee. They are gemmy and gorgeous. I’d love to wrap one for you. They are all over an inch in size and will be a showy piece that you will treasure. 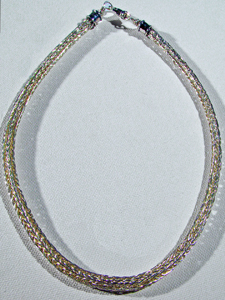 They will range in price from 100-200 dollars when they are wrapped in your choice of silver, gold or a combination. Are you seeing stars like I am? I love the shape and the symbolism of the star and I have it in all of the topaz colors as well as the druzies and in onyx. This will become one of your favorite pieces and a signature of your styles. This is my newest passion. It is a hand crafted Viking Knit chain. I took the class at the Bead and Button show in Milwaukee. This is a great chance to have a hands-on opportunity to learn a new technique. Well, I have always wanted to learn how to do this, and it is a bit tricky and very time consuming and addictive. Each chain has about 10 hours of labor. That’s a lot of television viewing. Actually, I take it wherever I go because it just fills the time beautifully. I make these is sterling, silver and gold plated wire and will be making them in gold-filled wire (which is the equivalent of 10 karat) I can make them any length. The sterling one with sterling endcaps and clasp is $150. The plated ones are $50. The gold-filled one will be $175. This necklace can be any diameter you want. This one is 6 millimeter. I would love to make one for you. I guarantee it will hold its shape and be a true heirloom quality piece. 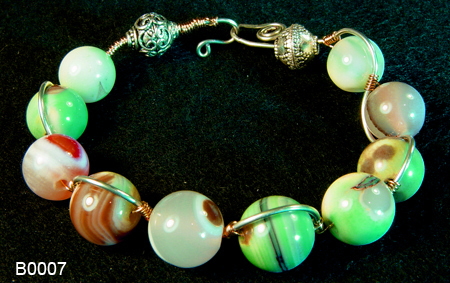 Linda Olsen is a gifted designer and maker of therapeutic jewelry items. She uses the finest materials from around the globe and hand crafts them into spectacular creations. But surprisingly, those looking for distinctive jewelry items are not her primary customers. It is those who are seeking the noted healing powers of nature's gemstones and crystals. How she came to understand these qualities of earth's natural treasures began when she was a little girl growing up in Dubuque, Iowa. Living on the banks of the Mississippi River, alluvial deposits formed sand and gravel bars that local building materials companies dredged and graded in huge piles of material filled with agates, quarts, and druzy. She would beg her father to take her to these gravel piles and hunt for stones, a pastime that turned into today's thriving enterprise. Linda still searches those gravel piles today, and her passion for stones has taken her to other places from the deserts of the Southwest, to the Rocky Mountains, Idaho, Montana, Wyoming and the Sierra Nevadas. She also imports many of her gem stones from overseas and has created an excellent and reliable network of suppliers who share her enthusiasm. In my search for exotic stones and crystals, I came upon several fellow enthusiasts in the field who believed that there was indeed something to the notion that some crystals have extraordinary healing powers. It makes sense if you think about it. Many of our most important nutrients and medicines come from minerals. Calcium is an excellent example. The many derivations of salt, a mineral we more commonly use to preserve and flavor our food or provide a necessary substance our body requires, has derivations that serve as the source for a whole family of pharmaceuticals that treat depression. When life is going smoothly, we scarcely think about our health, state of mind or family circumstances. However, when adversity strikes, we experience a variety of emotions. Helplessness, fear, anxiety, anger are the result, and we seek relief. All too often, solutions to these problems are not immediate. Some of these problems are unsolvable. It is this lack of control, scarcity of answers that make the problems of life even more difficult to face. Whether you are the individual affected or a concerned friend who stands by and watches the suffering, that hand wringing feeling of not knowing what to do can be very disconcerting. This is probably because we live in a world where we are told we are the masters of our own destiny; that bad things happen to other people and that if we buy enough insurance, eat the right foods, and take the correct precautions that we will be all right. But the fact is life is a slippery slope, and all kinds of things can occur. Therefore, when they do occur, our response may be something that is less than ideal. For example, a friend of mine was recently diagnosed with breast cancer, and as a concerned person, you really want to do something to make things better. The problem is that most of the solutions are in the hands of doctors, and laboratories, chemotherapy, and waiting, waiting, and waiting. We've all been there and done that. 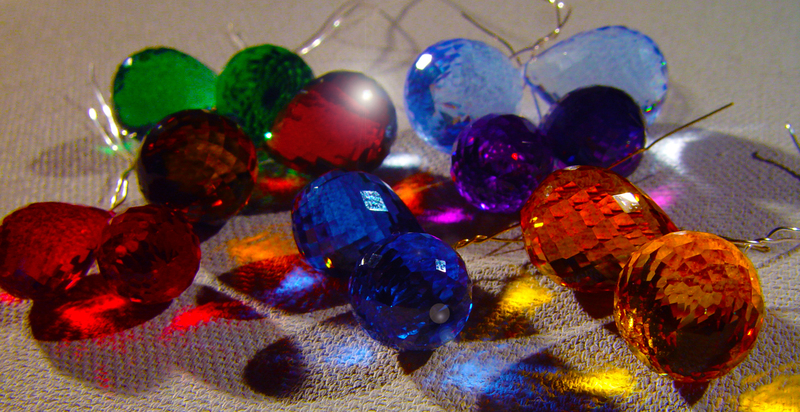 When my friend became ill, I was very interested in beading, jewelry and the metaphysical properties of stones and minerals. I saw her illness as a chance for me to create a bracelet that would not only show my support, but serve as a symbol of the healing that can come from the wishes of others and her own personal positive attitude. She cherishes her Believe cancer bracelet and says that it is a constant reminder to her of our friendship and acts as almost a talisman as she undergoes her radiation and treatment. I call one of my lines of therapeutic jewelry, "Comfort Bracelets." Other friends then came to me and said, “Well, I don't have cancer, but I have really felt depressed for a long time. I don't suppose you have something for that.” As a former clinical counselor, I would tell them that their first line of treatment is always to seek professional help, especially when the depression is so severe there are suicidal ideations. There is nothing like two weeks of treatment with the correct anti-depressant to change one's outlook on life, and it makes a world of difference in a person who is suffering. However, in this stress-filled world, we all go through periods of episodes of low-grade depression that may not warrant medical intervention. There are other modalities of therapy that therapists might prescribe, and one of those is cognitive therapy which is simply to change the way one thinks or looks at problematic situations. This involves changing negative thought patterns, giving up old grudges, training yourself to find the good things in life, and realizing that everything is not as bad as you thought it was. With the help of a good therapist this is a very effective treatment and has provided relief to many depressed individuals. However, think how helpful this bracelet could be in this treatment as a constant reminder of those skills learned through therapy and counseling. Once again, it would be a very meaningful gesture from a concerned friend or loved one. 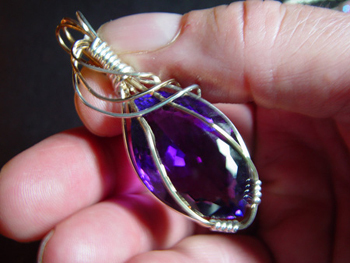 An precious faceted amethyst wrapped in gold filled wire (click on the image to learn more). The sources of my inspiration are the real gemstones and therapeutic crystals I've collected. I've gathered these treasures from the earth all of my life, and now I want to share with you what I've discovered. Minerals in the earth in all forms are the source of our life force. I'm of the belief that modern medicine (and that includes our pharmaceutical companies), in their quest to synthesize medications for maladies some of which we didn't even know we had, may have lost touch with what earlier civilizations and so-called primitive peoples knew about natural curative agents that literally surround us. The Bride's Bracelet Click here! New: Linda's fabulous Amber Collection! Depression Cancer A New Line! Opal Pendants PLEASE SHOW ME WHAT'S NEW! Headache Scroll down to learn about the healing properties of gems and minerals! 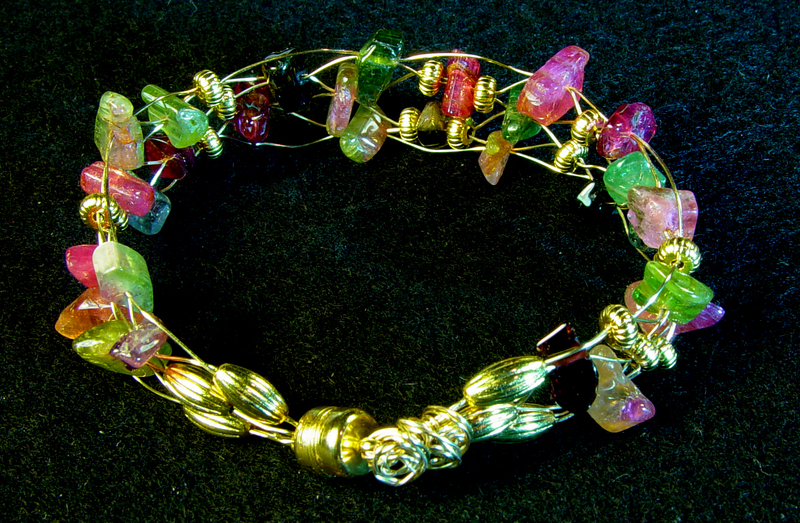 Celebration Bracelets See Linda's new line of wire Celebration Bracelets! Azurite clears stress, worry and grief and lightens the emotions. Blue Lace Agate provides relief for shoulder and back relief, arthritis and skeletal problems. Citrine is a happy, generous stone that eliminates gloom and negativity. It is useful for smoothing group or family discord. It raises self-esteem and self-confidence and removes destructive tendencies. It helps you move into the flow of feelings and become emotionally balanced. Kunzite clears emotional debris and frees up the emotions healing heartache. It is mood lifting and helps in depression. Excellent for alleviating panic attacks, it contains lithium and is beneficial for psychiatric disorders and depression. It helps the body recover from emotional stress. Lapis balances the physical, emotional, mental and spiritual levels—imbalances between these levels can result in depression. It encourages taking charge of life revealing inner truth. It encourages self-awareness and allows self expression and creative thought. Lepidolite reduces stress and depression. It stops obsessive thoughts relieves despondency and overcomes insomnia. It contains lithium and is helpful in stabilizing mood swings. 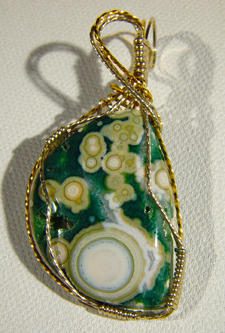 Moss Agate eliminates depression caused by brain imbalances. Obsidion reduces the pain of arthritis, joint problems, cramps and injuries. Opal has healing powers particularly for people suffering from depression. Legend says that opal can help its wearer find true and real love. Opal is the birthstone for October. 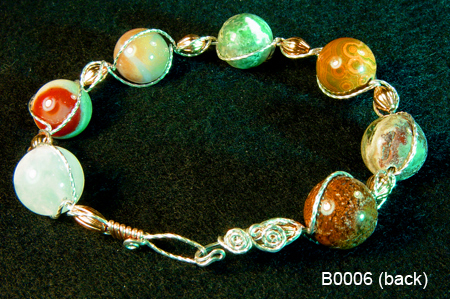 Opal is also the stone to ease childbirth. 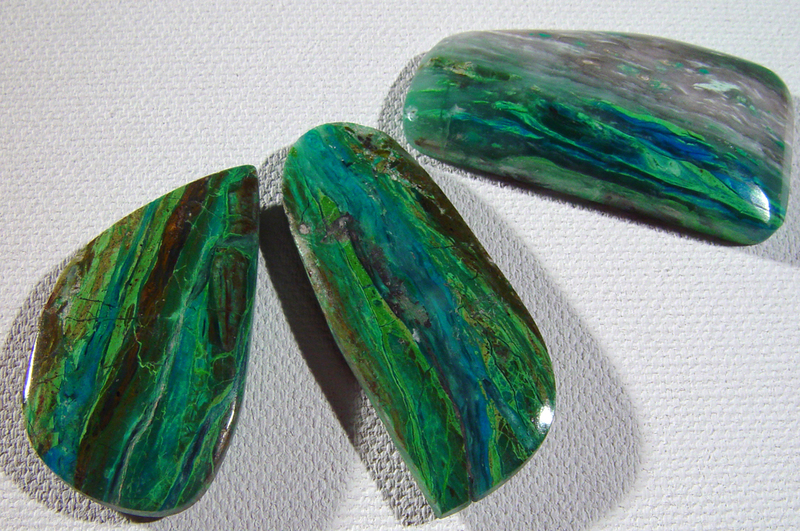 Opalized Quartz is an emotional stabilizer it strengthens the will to live and releases deep seated feelings of grief. It allows one to let go of the past. Morganite attracts love and maintains it. It encourages loving thoughts and actions. It cleanses the heart, calms a stressed life and helps you to recognize unfulfilled emotional needs and unexpressed feelings. Pearl attunes the wearer to the ebb and flow of life. It calms and centers and energizes. Purple Sugilite clears stress, worry, grief and sadness and lightens the emotion. Rhodochrosite detoxes the circulatory system relieves depression is useful for infection. 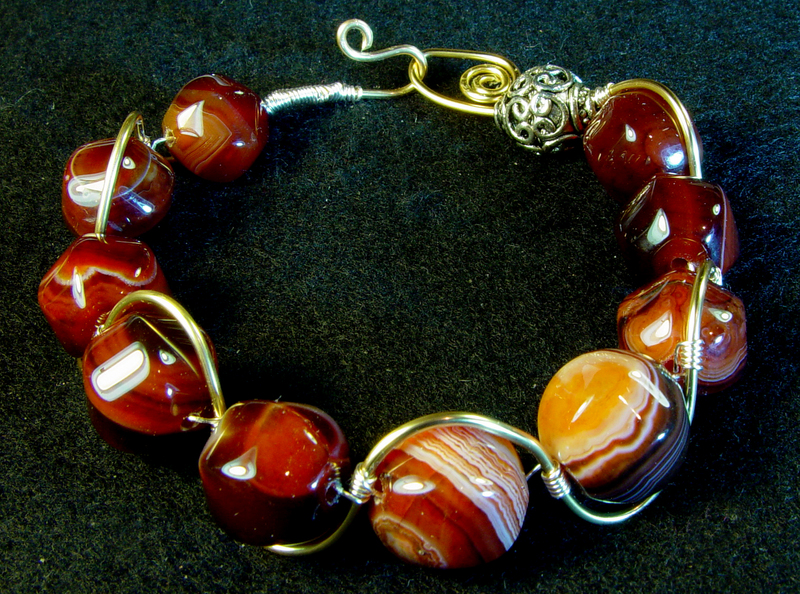 Sardonyx is the stone of strength and protection. It invokes the search for a meaningful existence and promotes integrity, lasting happiness and stability in marriage. It allows one to realize the delight of living and can be used to attract friends, good fortune and encourage self-control. It is known as the stone of virtue and stimulates ethical conduct throughout life. Serpentine is used to treat diabetes and hypoglycemia and is the talisman for a long life. Smoky Quartz is a superb antidote to stress and assists in enduring through difficult times. It relieves fear, lifts depression and brings emotional calmness and silences suicidal tendencies. It promotes positive thought. Sunstone is helpful for cartilage problems. Tiger Eye is a protective stone that is used as a talisman against ill wishing and curses. It shows the correct use of power and encourages integrity. It aids in collecting scattered information and is useful for healing personality disorders. Heals issues of self-worth. 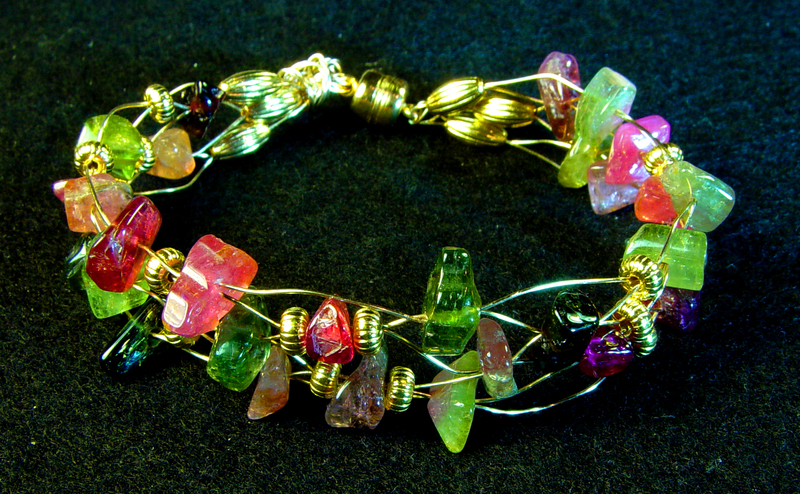 Tourmaline alleviates depression by eliminating fear and promoting internal security. Turquoise is a purifying and psychologically strengthening stone that eliminates a self sabotaging attitude of being martyred. It instills inner calm and aids creativity. It stabilizes mood swings and brings inner calm. © Gary Olsen 2016 all rights reserved. All graphics and copy in this Web site are the intellectual property of Gary Olsen and/or his clients' property, used with permission, and cannot be used for any purpose without permission. Address correspondence to olsega@mchsi.com.